Thanks, Mail Carrier | Celebrate National Chocolate Chip Day with Krusteaz! Celebrate National Chocolate Chip Day with Krusteaz! While there is no shortage of slightly obscure holidays that pass by without as much as a mention each week (you missed Go For Broke Day, Draw a Picture of a Bird Day, and National Jelly Bean Day last month, sorry! ), there are also those that I find that are worth celebrating. 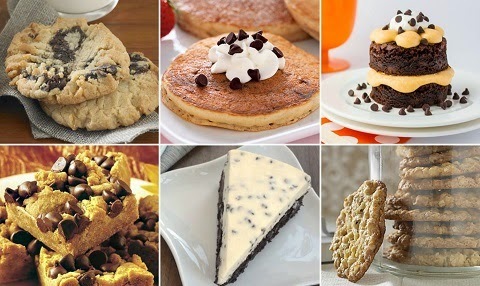 Namely that today, May 15th, is National Chocolate Chip Day! Yes, please! Although grabbing a package of tasty chocolate chips to whip up a standard cookie (or, ahem, eat them straight out of the bag) works, you can instead indulge your sweet tooth by providing a variety of even more delectable, delicious treats throughout the day by turning to Krusteaz! Whether you reach for one of their classic favorites or one of the new additions to their premium product line, you can be confident that they have included only the finest and freshest ingredients and that the result will be a guaranteed crowd-pleaser. Even better, I adore the way that Krusteaz baking mixes can be used as-is or can be incorporated into any number of great recipes for even more easy and delicious options. Case in point, go grab these three Krusteaz mixes immediately so that you can get in on celebrating National Chocolate Chip Day in style! 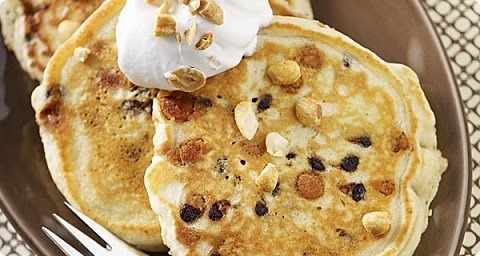 Start the morning off with chocolate chip pancakes or take it to the next level with Peanut Butter & Chocolate Pancakes. Prepare Krusteaz Chocolate Chip Pancake Mix as directed for 1 cup mix, adding ¼ cup peanut butter chips to batter (see below). Add 1 cup pancake mix and ⅔ cup water together with a wire whisk. Add ¼ cup peanut butter chips to batter. Batter will be slightly lumpy, do not overmix. Let batter stand 2 minutes. Pour slightly less than ¼ cup batter per pancake onto griddle. Cook pancakes 1-1¼ minutes per side, or until golden brown, turning only once. Combat the afternoon lull with fresh chopped espresso beans on top of Chocolate Espresso Muffins! Preheat oven to 400°F. In a bowl, stir together muffin mix, coffee, oil and eggs until well blended. Fill lightly greased to paper-lined muffin cups, filling ⅔ full. 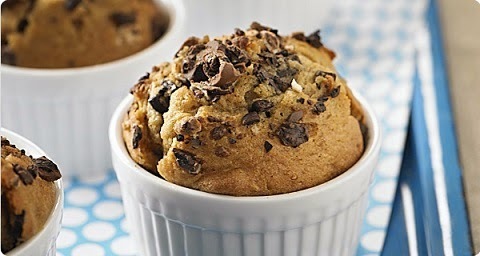 Top muffin batter with chopped espresso beans. Bake 17-19 minutes or until golden brown. Cool 5 minutes before removing from pan. Bake chewy and delicious cookies for recipes like Mini Cookie Ice Cream Sandwiches, perfect for the warmer weather! Prepare Triple Chocolate Chunk Cookie Mix as directed (see below). Allow cookies to cool completely. For each ice cream sandwich, add slightly softened ice cream between two cookies. Return to freezer until frozen. With everything from classic cookies to Pumpkin Spice Muffin Mix, there's a Krusteaz mix for everything. Whether you're like me and follow the recipe or you're more of a creative baker — it's very easy to take any Krusteaz mix and whip up your own creation — the end result is something that will always wow family and friends, whether for an important holiday like today or simply for a sweet treat! I was provided product from Krusteaz in exchange for writing this post, however, all thoughts and opinions are honest and my own. Celebrate! Love chocolate chips any day, but I'll make sure to have some today. I love chocolate chip cookies any time, especially hot out of the oven. I've used their pancake mix before, but never tried any of the other products. They look yummy! Oh dear, I missed Chocolate Chip Day! But those Peanut Butter & Chocolate Pancakes look so good, I think they might just show up on our plates soon. Better late than never, right? I love anything with chocolate chips! Krusteaz is a great brand. I love Krusteaz Thanks for the he;p.
I love chocolate chips I don't know how this "holiday" got past me!!! I have a hard time using them in a recipe b/c I gobble up the whole bag before I can make it, but I want to try some of these the pancakes and ice cream sandwiches - I need to buy at least 3 bags and hope I don't manage to finish them off first. How did I miss this?I love chocolate chips! 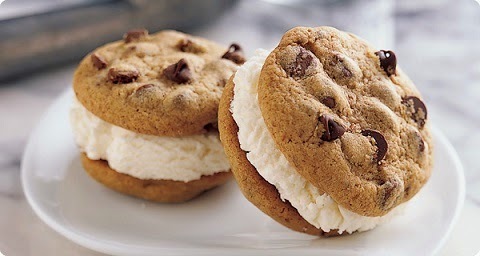 Those Mini Cookie Ice Cream Sandwiches would be perfect on this hot day! I would love to have an excuse to celebrate National Chocolate Chip Day with Krusteaz! The Chocolate Chunk Muffin and the Triple Chocolate Chunk Cookie to make Ice Cream Sandwiches are my favorites. You just can't go wrong with chocolate chips--these all look so yummy! These cookies with the chocolate and ice cream look absolutely wonderful for a nice and hot summer day. The Triple Chocolate Chunk Cookie recipe looks delicious. I am going to make some for my grandkids. Looks so so good. Thanks for all the great ideas..